Winnipeg, MB (March 21, 2019): An exhibition intervention of the Manitoba Museum’s Urban Gallery has been installed to commemorate the 100th Anniversary of the Winnipeg General Strike. Strike 1919: Divided City opens today and runs until January 5, 2020 and is included with admission to the Museum Galleries. 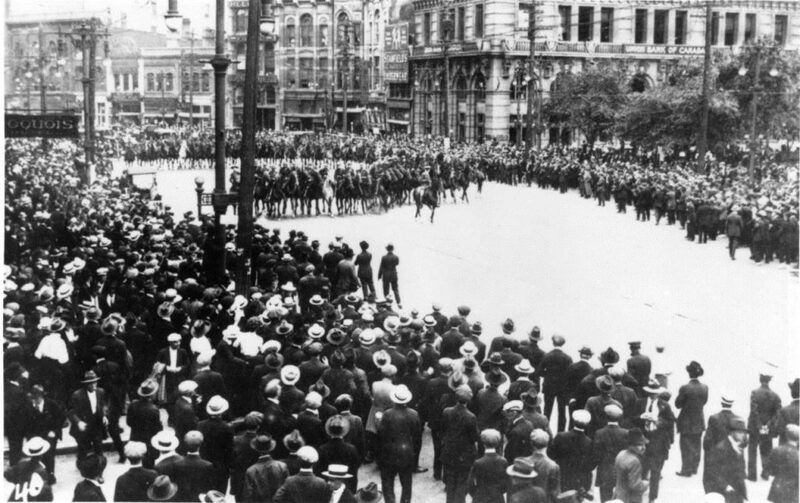 On May 15, 1919 Canada’s largest strike took place in downtown Winnipeg, spurred on by employers’ resistance to union organization, poor working conditions, stagnant wages, and unemployment intensified by returning WWI soldiers. The General Strike eventually encompassed over 30,000 workers. The city and police authorities were reluctant to take on the labour forces, in some cases joining them, and strikers organized the continued maintenance of some essential services. For many Canadians, the General Strike had alarming similarities with the Bolshevik revolution in Russia, which took place just two years earlier. Industry leaders organized a “Citizens Committee of 1000” to take action against the strikers. This led to collusion between federal and industry forces, resulting in the violent suppression of marching strikers. After six weeks the General Strike collapsed. The leaders were tried in court, and many were later involved in political movements, some of which later became active in politics. The 1919 Winnipeg General Strike was a major event in Winnipeg’s history and in the history of the nation. The exhibition intervention occurs within the Museum’s Urban Gallery, a favourite destination for many visitors and usually represents Winnipeg in 1920. For the purposes of the intervention, time has rolled back to 1919 and the story of the General Strike brought to life through audio-visual techniques and artifacts. A short video documentary showing in the Alan Theatre outlines the causes of the Strike and the political ramifications afterward. Audio clips from the Museum’s oral history collection and dramatic dialogues play in four of the gallery rooms, offering different points of view. And artifacts from Winnipeg unions and the “Citizens’ Committee of 1000” are on display throughout the Gallery. “We’ve rolled back time in the Urban Gallery to 1919 and installed a multi-media experience and some extraordinary artifacts. Visitors can immerse themselves in Winnipeg 1919, seeing and hearing the General Strike in a new and unique way, that highlights the divisions in the city and the experiences of people on the streets,” says Dr. Roland Sawatzky, Curator of History. “The Winnipeg General Strike of 1919 was an important chapter in the history of our province and our country. And we are fortunate that the timing of the Strike 1919 exhibition will result in many of the elements becoming permanent aspects in the renewed Urban Gallery space adjacent to a new Winnipeg Gallery opening the fall of this year,” adds Claudette Leclerc, Executive Director and CEO of the Manitoba Museum. The Manitoba is grateful to its funders: the Government of Canada Community Anniversaries Fund and Heritage Grants Program; and the Government of Manitoba; its sponsors: Manitoba’s Unions, the International Alliance of Theatrical Stage Employees Union 856 Motion Picture Technicians, Manitoba Government and General Employees’ Union; media sponsor, the Winnipeg Free Press; and, supporters: The Manitoba Museum Foundation, and the Endowment Council of the Canadian First World War Internment Recognition Fund.